In this seventy-second archive story by Kristian Bertel, we take a look at the famous Taj Mahal Palace Hotel in Mumbai, India. It is one of oldest properties of Mumbai suburban and this hotel built in the Colaba region of Mumbai in Maharashtra, India is situated next to the Gateway of India. Historically it was known as the 'Taj Mahal Hotel' or the 'Taj Palace Hotel' or simply 'The Taj'. The hotel is an establishment that provides paid lodging on a short-term basis and facilities provided may range from a modest-quality mattress in a small room to large suites. The Taj Mahal Palace is a 5-star luxury hotel in the Taj Hotel chain, located in the south of Mumbai, India near the pompous triumphal gateway of India. Founded in 1903, the hotel was built in an architectural mix of Oriental, Moorish and Italian Florentine styles that have made the Taj Mahal Palace in Mumbai the flagship of the Taj chain. This magnificient hotel's original building was commissioned by Tata and first opened its doors to guests on 16 December 1903 and the twentytwo-floor Taj Mahal Palace has a rich blend of European and Islamic-style architecture. The hotel offers panoramic views of the Arabian Sea from the rear of the hotel, while the hotel’s entrance at the front faces west. It is considered the flagship property of the group and has fivehundred sixty rooms and forty-four suites, employing some 1,600 staff. The hotel is actually made up of two different buildings, the Taj Mahal Palace and the Tower, which are historically and architecturally distinct from each other. The former was built at the start of the twentieth century, while the latter was opened in 1973. The hotel has a long and distinguished history, having hosted many notable guests, from presidents to captains of industry and stars of show business. Pakistan's founder, Muhammad Ali Jinnah's second wife Ratanbai Petit lived in the hotel during her last days in 1929 and her mother, Sylla Tata, was born into the Tata family. During World War I the hotel was converted into a military hospital with sixhundred beds. This hotel building in India has onion domes and a grand pointed arch depicting sixteenth-century Islamic architecture. The building has a central iconic red dome and two wings topped with smaller domes and the façade of the hotel is of oriental style. The Taj Mahal Palace Hotel is built from yellow basalt and reinforced concrete, while the dome was constructed with imported steel that was used for Eiffel Tower and the Tata suite has Markrana marble flooring and the interiors of the hotel are designed in Florentine, oriental and Moorish styles. The ceilings of the hotel are vaulted in alabaster and onyx columns and the building has graceful archways and a cantilever stairway. It also features pietra-dura floor panels and fretted stone panels at the lobby of the tower wing. The interiors are decorated with hand-woven silk carpets, art collections, crystal chandeliers, eclectic furniture and magnificent artefact collections. The hotel comprises two completely separate buildings, each in its own style. The original hotel is built as a sumptuous and pompous building, while The Tower immediately east of it, despite its greater elevation, seems to rise in reverent respect for the older and more pompous ornate main building. But the hotel is most known for being the most visible target during the 2008 Mumbai attacks. Known as Mumbai's Manhattan this hotel was alongside the nearby Leopold Cafe and Colaba Police Station among the targets of the Mumbai terrorist campaign in November 2008. very heavily included by the violent ravages of the terrorists with hand grenades, arson, use of smaller bombs as well as hostage taking and shelling of guests and employees with automatic weapons with many killed victims as the tragic consequence. It is widely believed that Jamsetji Tata decided to build the hotel after he was refused entry to one of the city's grand hotels of the time, Watson's Hotel, as it was restricted to Whites only. However, this story has been challenged by many commentators who suggest that Tata was most unlikely to have been concerned with 'revenge' against his British adversaries. Instead, they suggest that the Taj was built at the urging of editor of The Times of India who felt a hotel Worthy of Bombay was needed. 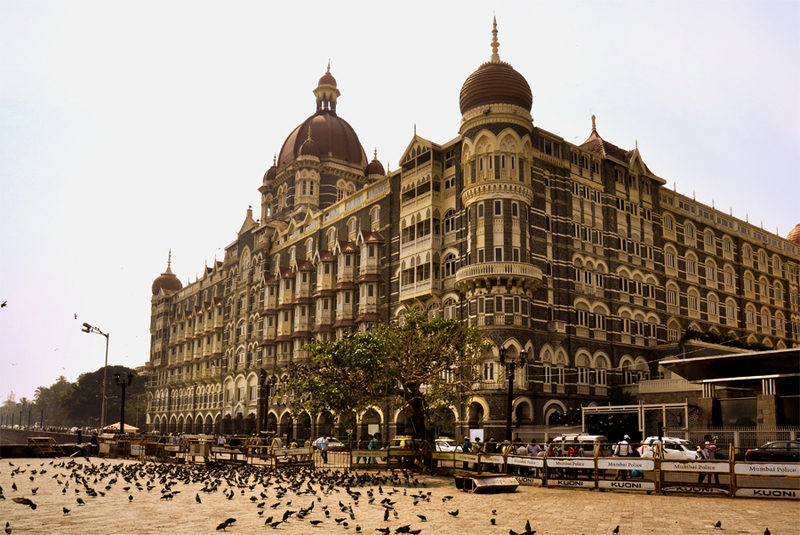 Taj Mahal Palace Hotel was specifically chosen by Lashkar-e-Taiba, a terror group who attacked multiple targets, for an attack so that it will be Striking a blow against a symbol of Indian wealth and progress. The hotel was attacked on 26 November 2008, during which material damage occurred, including the destruction of the hotel's roof in the hours following. Hostages were taken during the attacks and at least 167 people were killed, including many foreigners. The casualties were mostly Indian citizens, although westerners carrying foreign passports were singled out. Indian commandos killed the gunmen barricaded in the hotel, to end the three-day battle on 29 November. At least thirtone died at the Taj. Approximately fourhundred and fifty people were staying in the Taj Mahal Palace Hotel at the time of the seizure. The attack was planned using information compiled by David Headley, a Pakistani-American, who had stayed at the hotel multiple times. The Mumbai attacks were planned and directed by Lashkar-e-Taiba militants inside Pakistan and carried out by ten young armed men trained and sent to Mumbai and directed from inside Pakistan. Only one of the ten attackers, Ajmal Kasab, survived the attack. He was hanged in Yerwada jail in 2012. The other nine attackers killed during the onslaught were Hafiz Arshad alias Abdul Rehman Bada, Abdul Rahman Chhota, Javed alias Abu Ali, Fahadullah alias Abu Fahad, Ismail Khan alias Abu Ismail, Babar Imran alias Abu Akasha, Nasir alias Abu Umar, Nazir alias Abu Umer and Shoaib alias Abu Soheb. According to scholar Saroj Kumar Rath, three local Indians, Basheer, Sabahuddin Ahmed and Fahim Ansari, helped the attackers in carrying out the Mumbai attacks. David Headley was supported by Basheer, who arranged the travel documents for him. Preliminary figures indicate that only 10 terrorists participated in the attack. The nine were killed by Indian security forces. The arrested is believed to be the twentyone-year-old Pakistani Ajmal Amir Kamal, who was questioned by the Indian authorities and the Indian authorities have pointed out relations with Pakistan, but this is denied by Pakistan, which, however, admitted that parts of the planning and training may have passed in Pakistan. Another explanation is that the top trained terrorists came from and are trained in the shared Kashmir, which both India and Pakistan claim. But it is unlikely when the terrorists spoke Punjabi and the vast majority of Punjabi Muslims live in Pakistan, while in Kashmir, Urdu and Hindi are spoken by both Muslims and Hindus. India is a land full of stories. On every street, on every corner and in the many places in India, life is rushing by you as a photographer with millions of stories to be told. In the archive story above, you hopefully had a readable insight in the story that was behind the photo of a hotel in Mumbai. On this website of Kristian Bertel | Photography you can find numerous travel pictures from the photographer. Stories and moments that tell the travel stories of how the photographer captured the specific scene that you see in the picture. The photographer's images have a story behind them, images that all are taken from around India throughout his photo journeys. The archive stories delve into Kristian's personal archive to reveal never-before-seen, including portraits and landscapes beautifully produced snapshots from various travel assignments. The archive is so-far organized into photo stories, this one included, each brought to life by narrative text and full-color photos. Together, these fascinating stories tell a story about the life in India. India, the motherland to many people around the world, a land of unforgetable travel moments. The archive takes viewers on a spectacular visual journey through some of the most stunning photographs to be found in the photographer's archive collection. The photographer culled the images to reflect the many variations on the universal theme of beauty and everyday life in India. By adding these back stories the photographer's work might immensely enhanced the understanding of the photographs.